Be the first to share your favorite memory, photo or story of Salud. This memorial page is dedicated for family, friends and future generations to celebrate the life of their loved one. 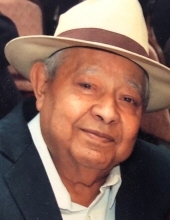 Salud Jiménez, age 80 passed away peacefully on Wednesday, March 20, 2019 at Rush University Medical Center in Chicago, Illinois. Beloved Husband of Tere Jiménez; cherished father of José (Adriana) Jiménez, Rosalba (Alberto) Rodríguez, Lourdes (José Monarrez)-Jiménez, Esmeralda Jiménez, Álvaro Jiménez, Salud “Yoyo” (Macaria) Jiménez Jr. and Cuca Ambriz Jimenez . Dear Grandfather of Karina, Adam, Gabriela, Alberto Jr., Bianca, Nadia, Aarón, Andrea, Amanda, Emilio, Nicolás Jr., Fabián, Julián and Mikael. Great Grandfather of Elena, Lincoln and Lucas Salud. He was a long life resident of Pilsen. Avid soccer fan, his favorite team “Las Chivas” and a longtime South Side Sox (Chicago White Sox) fan. Salud will be greatly missed by his family and all those who knew him. To send flowers or a remembrance gift to the family of Salud Jimenez, please visit our Tribute Store. Friends and neighbors will meet for the 10:00AM Celebration of Life/ Mass of Resurrection at St. Paul Church 2124 W. 22nd Place Chicago, Illinois 60608. "Email Address" would like to share the life celebration of Salud Jimenez. Click on the "link" to go to share a favorite memory or leave a condolence message for the family.